Management believes that there are certain non IFRS financial measures that can be used to assist shareholders in determining the performance of the Company. 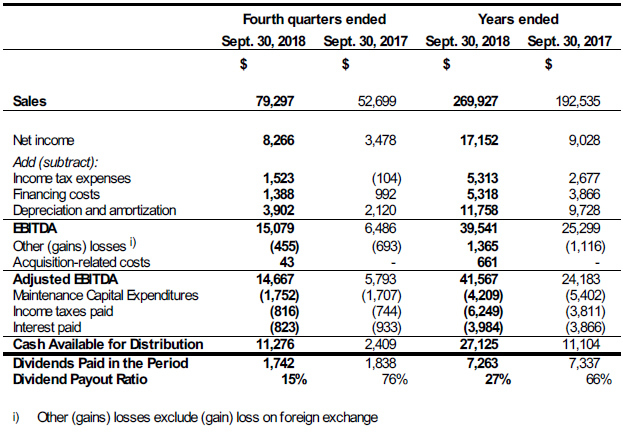 The table below highlights certain financial results and reconciles net income to EBITDA, EBITDA to Adjusted EBITDA and Adjusted EBITDA to Cash Available for Distribution for the fourth quarter and the year ended September 30, 2018 and the comparative periods in fiscal 2017. Sales for the quarter and year ended September 30, 2018 were $79,297 and $269,927 compared to $52,699 and $192,535 for the prior comparable periods, representing increases of 50% and 40% respectively. These increases are a result of the additions of MaXfield Group Inc. (“MaXfield”) and Fischer Tanks LLC (“Fischer Tanks”), which did not contribute in the prior comparable periods, as well as increased levels of business activity in the Fuel Containment and Processing Equipment segments. Adjusted EBITDA for the quarter and year ended September 30, 2018 was $14,667 and $41,567 compared to $5,793 and $24,183 for the prior comparable periods. This represents increases of 153% and 72%, which are a result of the reasons explained above. In reconciling EBITDA to Adjusted EBITDA, non-recurring acquisition-related costs of $661 associated with the acquisition of MaXfield have been added back. Maintenance Capital Expenditures were $1,752 for the quarter versus $1,707 for the prior comparable period. During the period, the Company’s total purchase of property, plant and equipment was $2,145 of which $393 is considered growth capital. This growth capital includes additions to the Company’s rental equipment fleet, as well as manufacturing equipment to support capacity expansions and process improvements in several of its businesses. Cash Available for Distribution increased 368% quarter over quarter and 144% year over year. These increases are largely explained from the recent acquisitions and increased business activity in Fuel Containment and Processing Equipment. TerraVest saw greatly improved results this year versus the prior year due to contributions from recently acquired businesses and newly added product lines, as well as a general increase in business activity. The Fuel Containment segment continues to see increased demand for most of its products and throughout next year management expects to realize the full benefits of recently added products lines and growth capital expenditures aimed at capacity expansion and efficiency improvements. Management’s expectations for the Processing Equipment segment are positive as this segment will benefit from a full year of contribution from the recently acquired MaXfield. However, recent volatility in commodity pricing could have a negative impact moving forward. The outlook for the Service segment is not materially different than the prior year. Pricing pressure has been a major challenge for this segment. Management expects this to persist until commodity pricing improves. Global steel prices, tariffs and supply constraints continue to be a challenge for the Company as a whole. Management is working diligently with the government and suppliers to mitigate the impact. TerraVest is also pleased to announce that The Board of Directors has declared its quarterly dividend of 10 cents per Common share payable on January 11, 2019 to shareholders of record as at the close of business on December 31, 2018. The dividend is designated an “eligible dividend” for Canadian income tax purposes. Additional information can be found in TerraVest’s annual consolidated financial statements and MD&A which are available on SEDAR at www.sedar.com.